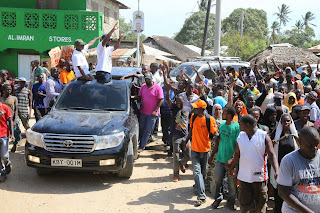 Lamu Local residents claim Joho 'Kick Out' at Mpeketoni is Tribal and Religious not Political . - Bana Kenya News, Real African Network Tubanane. Home featured Mombasa Lamu Local residents claim Joho 'Kick Out' at Mpeketoni is Tribal and Religious not Political . Lamu Local residents claim Joho 'Kick Out' at Mpeketoni is Tribal and Religious not Political . Political tension in Lamu following the incidence that happened on Sunday at Mpeketoni where governors vehicles were smashed with rotten Mangoes on a market day. According to the heat on the ground, the Jubilee supporters and NASA supporters claim that what the Mombasa Governor went through in that area is tribal, not political. Some native residents claimed that the action that happened is due to tribal lines. " We welcomed them knowing that they are people who respect others opinion but it looks like they like confronting others." Karisa Balozi said. The Mombasa Governor has been very vocal on the issues affecting the Coastal counties. The governor who is now termed as "Sultan of Coast" claimed that the government gave Kiambu and Kirinyaga counties Kes 20 Billion to repair feeder roads while the road from Garsen to Lamu which is a highway has not been allocated anything. "Everyone here in Lamu if you ask what happened to the governor's vehicles when they were heading to Lamu will give a direct answer. If you ask, who were the first people to throw Mangoes at the governor? definitely, even a young kid will give an answer. The answer is obvious." A teacher a Mpeketoni narrated. People took that dispute in the social media condemning the act as shameful and should not be repeated. The leaders at Mpeketoni and it environment apologised to the Mombasa governor on behalf of their people claimed that it was because of anger. According to the local residents in Lamu, they vowed to make Jubilee suffer in the region when they set a rally. The Lamu county commissioner Joseph Kanyiri warned the people who are now planning for a revenge in any Jubilee rallies that are being watched. Here are some of comments from people who live in Lamu on the social media.